Down in the sewer lair, Splinter is meditating when he feels a disturbance in the force. He projects his astral form to follow the bad vibes and they take him to the depths of the ocean. 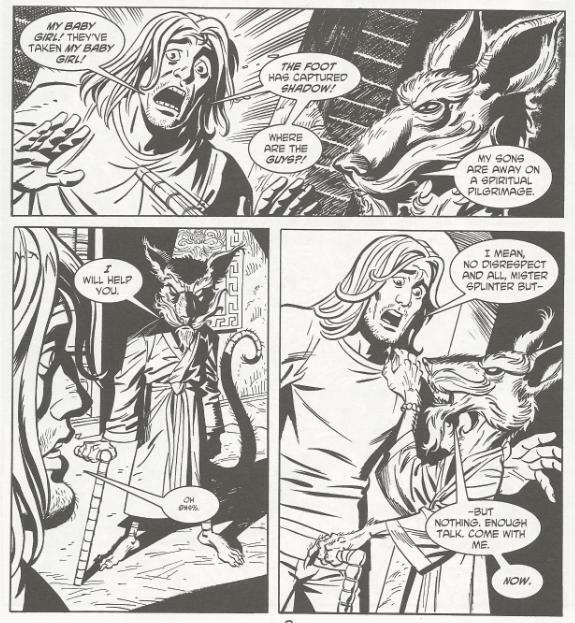 Splinter begins to suspect the worst, when Casey comes storming in, screaming that Foot Soldiers kidnapped his infant daughter Shadow. 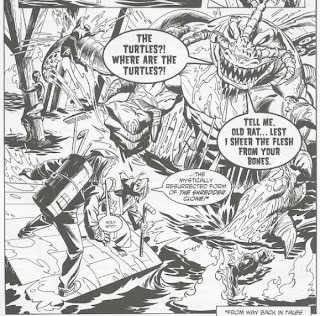 Casey asks where the Turtles are and Splinter informs him that they are off on a spiritual pilgrimage and cannot be contacted. Splinter vows to help Casey and asks what happened. Casey explains that he was taking Shadow through a walk in Central Park in her stroller, when a bunch of Foot Soldiers descended from the trees and attacked. He fought off as many as he could, but they managed to separate him from the stroller and escape with Shadow. 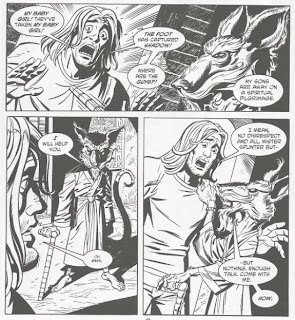 Splinter finds it strange that they let Casey live and suspects they’re setting a trap, using Shadow as bait. Casey and Splinter return to the scene of the crime in Central Park and find Shadow’s discarded stroller and stuffed animals. Enraged, Casey tells Splinter they need to stop by his apartment to pick some things up before they hunt down the Foot. A little while later, Casey emerges from his apartment with his hockey mask and golf bag full of blunt instruments. Racing over the rooftops, he and Splinter follow the Foot’s tracks west toward an old factory on a pier. Splinter says that the factory was the scene of a previous battle with the Foot and is most likely where the Clan’s trap will be sprung. Having merged with Mashima the Foot Mystic, the Shark Shredder was able to regrow himself. He then got about plotting his revenge against Splinter and the Turtles, using Casey and Shadow as bait. No longer needing Shadow, the Shark Shredder drops the baby in the icy water. Casey dives in and rescues her, dodging the Shark Shredder’s tentacles and claws. Splinter feels the presence of Mashima within the Shark Shredder’s consciousness and communicates with him spiritually. Mashima is loathe to be trapped inside the Shark Shredder and desperately wants to end the abomination. Splinter and Mashima then begin a psychic attack on the Shark Shredder while Casey attacks him physically, smacking him upside the head with a golf club. The dual attacks succeed. Mashima’s spirit is freed to the afterlife and the Shark Shredder collapses and impales himself on a broken beam, dying. Mashima thanks Splinter for his help, vowing that he no longer thirsts for revenge. Splinter forgives Mashima and wishes him well. As fire fighters see to the scene, Casey and Splinter slip away. Splinter returns Shadow to Casey (after she pulls on his whiskers). All is well in the end, save that Shadow needs a diaper change. 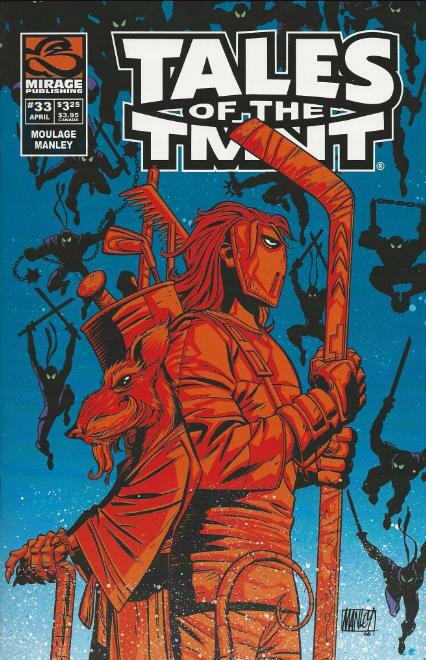 *Chronologically, I would place this shortly after TMNT (Vol. 2) #13. *Mashima and the Shark Shredder last appeared in Tales of the TMNT (Vol. 2) #4, where they fought the Turtles and Splinter at the factory and were thought dead. *The Turtles forged a truce with Karai and the Foot Clan in TMNT (Vol. 1) #61. Obviously, the Foot Soldiers in this issue were loyal to the Shark Shredder and not Karai, hence the lack of acknowledgement to the truce. *This issue was originally published with a back-up story, “Credo” by Will Tupper, Eric Theriault and Erik Swanson. Well, it took forever, but Tales of the TMNT eventually sewed up the lingering cliffhanger from the end of the initial Shark Shredder arc. Just be grateful the plot thread GOT a conclusion. Most ongoing storylines in Tales of the TMNT (Vol. 2) never received endings. Anyhow, “The Bait” moves at mach speed to get everything established and concluded within 23 pages. This sucker is in a HURRY. Like many Tales stories, I do kind of wish it had been given two issues to flesh out its plot and conflict, but multi-parters were pretty rare in this book, so I guess it would be asking too much. For as hectically paced as “The Bait” is, I think Moulage deserves some credit for managing to economically pack it all in there. Moreso than the return of the Shark Shredder, I think the real value of “The Bait” comes in the unexpected and abnormal pairing of Casey Jones with Master Splinter. Never was there more of an odd couple. Sadly, the race to get the whole tale told in one issue somewhat squanders the potential for fun, as Splinter and Casey are rarely afforded the opportunity to play off of one another. They get a few good lines in, and I rather liked seeing Splinter bonk Casey on the head with his staff to calm him down, but the opportunity for so much more humor was there if the story had just had the time to breathe. Casey was portrayed really well in this issue, I think. Though he “relapses” back to hockey-masked vigilante mode for possibly the first time since “City at War” (he put on a mask in Vol. 2 for one fight, but it wasn’t his hockey mask), his growth as a character isn’t forgotten. He’s doing this to save his daughter, who was his whole reason for leaving the vigilante life behind. 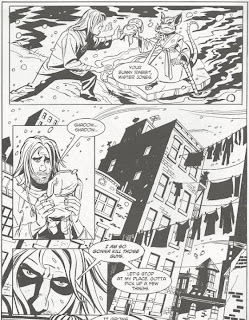 Casey’s desperation to save Shadow is palpable and artist Mike Manley strikes some great expressions of fear and confusion on him (particularly the bottom panel of page 4). 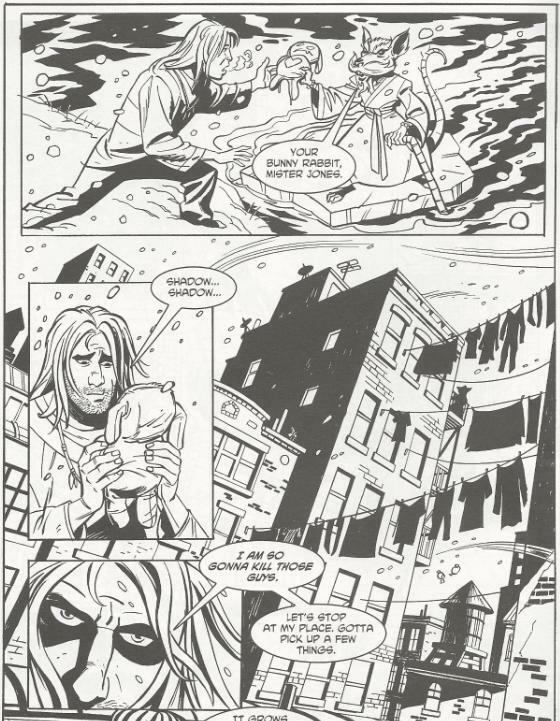 The page 11 pin-up of Casey in vigilante mode was a nice piece, too, and his relapse feels like a suitably “big” moment. Leaving the whole vigilante thing behind was a pretty major plot point of his arc during “City at War”, so it’s nice to know the writers for this story didn’t “forget” about Casey’s retirement and gave the moment the drama it deserved. And considering how fast this story rushes by, actually stopping for a splash page feels especially “big”. As for the Shark Shredder and Mashima, well, they’re kind of dispatched with too much ease. The Shark Shredder makes his epic comeback on page 17 and he’s dead by page 22. Still, for what little we see of him at the end of this story, I loved what we got. When the Shark Shredder rises from the river and smashes the factory, he utterly disregards the welfare of all his Foot Soldiers. 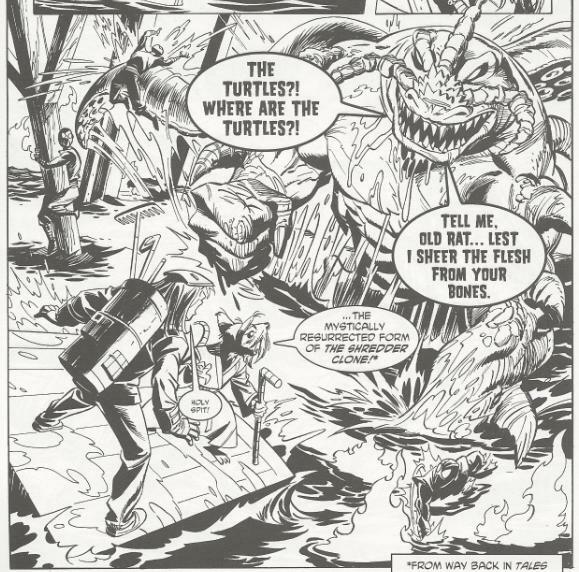 In every panel, they’re seen hectically clinging to wooden support beams, getting swatted by the Shark Shredder’s tentacles, frantically swimming in terror from the man-eating sharks the Shredder summoned, and so forth. It’s funny, but it gives a bit of personality to this monstrous, abomination of a Shredder, showing how little he cares for human life (he kidnapped a baby, after all) and how willing he is to callously sacrifice anyone and anything just to get revenge. I think, conceptually, “The Bait” had the potential to be a lot better than it wound up being. 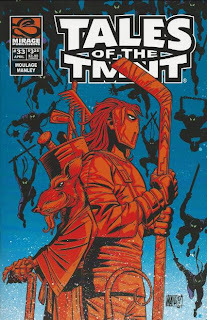 There are great ideas in here, like the oddball pairing of Splinter and Casey, and there are some big moments, like Casey coming out of retirement to save Shadow and the return of the Shark Shredder, but it rushes through them with a “let’s just get this over with” attitude that almost sinks it.